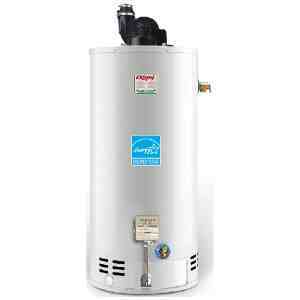 Giant gas water heaters that utilize a water storage tank are available in only a few but most popular sizes, are powered by the natural gas and liquid petroleum gas and include several venting options. All the models, no matter of the type, are designed for potable water and space heating applications that operate with the low NOx gas emission. Based on the way how products of gas combustion are removed from the unit's combustion chamber outside, Giant water heaters are divided into several groups, all using different venting systems; atmospheric, direct, power direct and power vent models. Based on the type of the venting system, gas water heaters are more or less efficient and providing more or less flexibility during installation. Giant gas water heaters with the atmospheric vented system can be connected to the gas vents or chimney and remove the products of combustion naturally. Some models are equipped with the 24-volt flue damper for the enhanced energy efficiency and Energy Star compliance. These heating products also utilize few exclusive features such as the “Power Twist Baffle” that when compared to the standard flue baffle, results in increased efficiency of the unit. Also the “GreenFoam” - and Eco-friendly foam insulation has great insulating qualities for the increased units’ efficiency. There are several models available in this group, sizing from 30 to 60-gallon capacity and providing sufficient water supply from one to four people in the household. The main disadvantage is the low energy factor, ranging from 0.57 to 0.62, which, when compared to the Energy Star models provide much lower energy savings. Power Vent category comes in two groups; one group with three sizes; UG40, UG50, UG60 and one size in the UG50-65 group. The energy factor is in the range from 0.59 for the UG50-65 model, which also has the highest power of 65,000 BTU, to 0.67 found on the UG40 and UG50 model, making them high-efficient and Energy Star approved. As opposed to the above atmospheric models, power vent water heaters do not require a chimney, these can vent directly through the roof vertically or horizontally through the exterior wall. The maximum vent length is 140 feet found on the PV1 models, almost three times longer than the vent length found on UG50-65 models. Giant gas water heaters with the power venting offer more flexibility during the installation - longer vents, a variety of materials, and have more advanced features than the previous group. Except for the “GreenFoam” and the “Power Twist baffle” (not found on UG50-65 models) they are designed with the Intelli-Vent gas control that provides better accuracy and control, including easier troubleshooting, and the silicon nitride igniter, which is more durable and efficient than the standing pilot. Power direct vent models are very similar to the above power vent models, three sizes, features, and 40-gal and 50-gal capacities, with the energy factor of 0.67 and Energy Star compliance for both… Venting options are also similar, 2” and 3” vent sizes, while the maximum vent length is shorter - 80 feet. The “Power Twist baffle” that is responsible for keeping the heat longer inside the water heater and therefore increasing the efficiency of the unit is not included. Two models with the capacities of 50 and 60 gallons are designed with the direct venting, which, as opposed to the above models, uses only co-axial flexible venting directly through the exterior wall, with no chimney required. Direct venting and sealed combustion chamber allow the fresh air intake from the outside, where the exhaust gases are vented too. Since there are no elements that require electricity, including the piezo igniter, these water heaters are electricity independent making them ideal for regions with the frequent power outages. The main disadvantage is the low energy factor ranging from 0.56 to 0.58. Giant gas water heaters that utilize the water storage tank are designed for potable water and space heating applications and include the FVIR technology, which prevents the accidental combustion of the flammable gases (from gasoline for example) outside the combustion chamber. The warranty on all residential tank-type models is 8 years on the storage tank and 6 years on other components. TTX series is the combination of the tank-type and tankless model that takes advantage of the top features found on both types. This hybrid unit installs easily indoor, as the tank-type, and provides the comfort of the tankless water heaters – on demand water heating and the increased supply of hot water. The water storage tank has a 40-gallon capacity but the First Hour Rating is two times bigger than a standard type - 180 gallons. Also, it can increase its power from the minimum of 59,500 BTU to the maximum of 91,300 BTU, heating water with the efficiency of 80%. All this provides greater comfort, and thanks to the higher efficiency, standby heat loss is lower than the standard type. The electronic ignition and temperature control allows better and more accurate temperature control. TTX hybrid water heater can be used in residential applications where it offers a 10-year warranty on the heat exchanger and 6 years on the tank, and shorter warranty when used in commercial applications or combination potable water and space heating.